I have had my business now for just over six years. I have grown this business to a place of comfort. I have done MY design, MY way and served clients on visual branding, website design and marketing. I read a quote today by MLK that says, “You must decide to speak for yourself; nobody else can speak for you.” Today it rings clear. For years now I have received questions from clients making sure that I was the one doing the design. I have had people come to me for designs based on drawings that I do just for fun. People always comment, I always know it is from you because of your handwriting or it is my clean style. Even at my wedding, my dear florist, Springvine Design, said – you are no longer allowed on Pinterest… You tell me what speaks to you, not what you think others believe to be beautiful. I ended up with the most amazing wedding that was so true to myself. 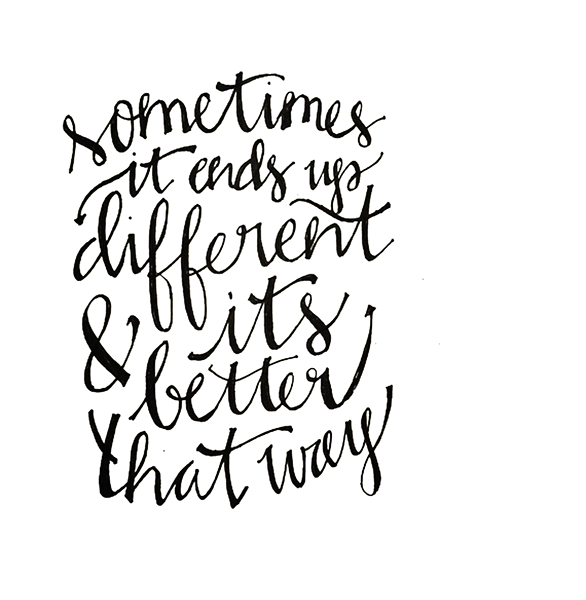 So why – why was I pushing myself to conform to others when all of this talent was in me? New days are ahead!!! I have always compared myself to others. Looked at other designers, followed trends and made sure I was fitting in. Well now is the time for a shift. I am giving more of myself these days. What does that mean? I am following my gut vs comparing my design to others. I will use my years of experience and knowledge, and share that with you. It may be design tips or what I consider to be a trend – but it will come 100% from me. I will share my art and my passion for design. 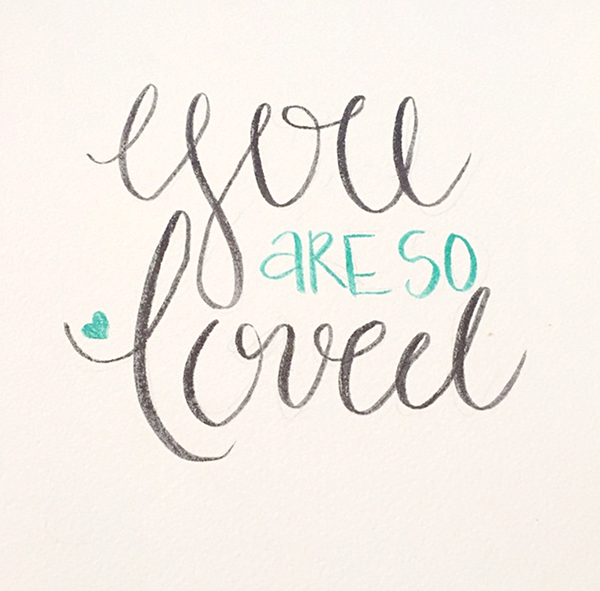 In hand lettering – I will use my handwriting and my style vs trying to copy what I see as beautiful as I thumb scroll through IG. I will create an email platform for you all to share inspiration and education on graphic design. I have learned from some of the best through the years and now it is time for me to give back! With all of this said, Is there anything you would like to hear? Like to learn? PLEASE share! I am here, with my whole creative self for you! Want to dig deeper and tell your story? Contact me to get started today with your creative process!! I was recently given the opportunity to work with The Nester to design a logo for her upcoming event… NEST FEST. This will be an event at her barn (#atthewhitebarn) in Midland, NC. It is one you will not want to miss…. food trucks, vendors, pickers, artists, farmers. It is October 22 – rain or shine, so mark your calendars now! Tickets will go on sale soon so be sure to follow her blog and online to stay in the loop! When I was approached about doing the logo design for this – I jumped at the chance! 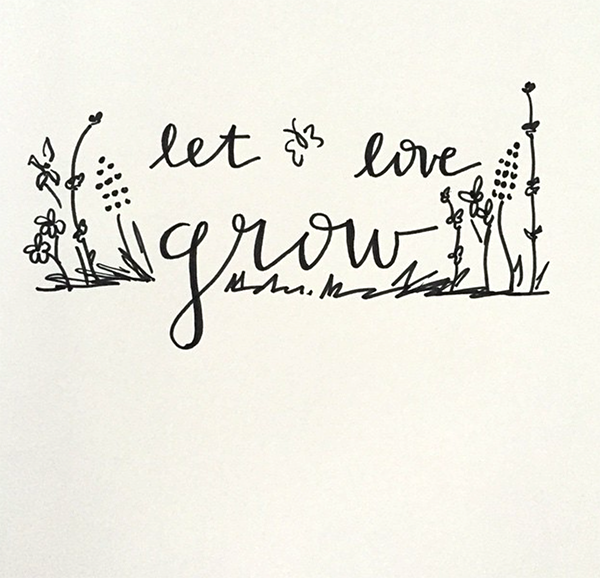 I have been following The Nesting Place for years now and she wanted a design that combined all of my favorite things… line art, hand lettering, and water color! Yes, Yes, Yes! I design all of my logos on the computer and add elements to make them look hand drawn. This allows the client to use their logo as large or as small as they like and in any way that they chose. I can deliver the logos in vector format, print ready, and web ready! It works out perfectly. It also allows me to break apart elements of the logo so that they can be used as needed. She is working hard with Created Beautifully & Angela Statzer to find the perfect vendors for the event… so if this sounds like something you would be interested in, click here for more information. 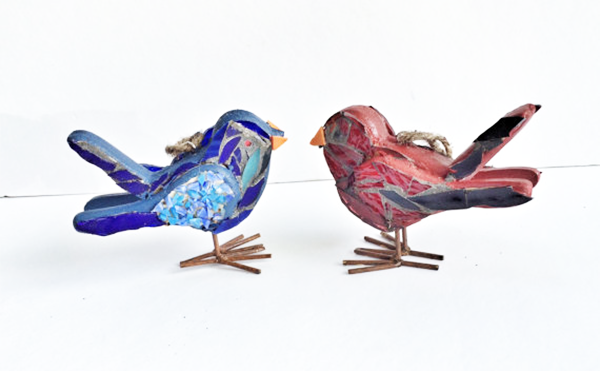 She has also been picking and collecting and beauty hunting like mad and will have a huge booth full of pretties for your home at the Nest Fest! Currently we are working on a map that lists out her favorite thrifting spots around this area, so be on the look out for that! It is going to be great and I can’t wait to get started! If you would like to see more of my line art – visit my website. I have been drawing places and things for a while and have a collection. Just last month I had someone reach out about using my Duke Chapel drawing for a t-shirt and It made my heart sing! It is so great that they can be used in so many ways. Here is one from a few years back reminds me so much of this day…. country life, old barns, porch swings, good food, and awesome company! I am a visual story teller. I visually tell the story of companies or individuals by designing graphic representations of their vision and goals. When you say the word brand it means many things… It means your logo, but it is also the colors you use, the styles you apply, the clothes you wear, the automobiles you drive, and the tone in which you write. Each part is equally as important. There are people who specialize in brand creation…My role in this equation is to graphically represent your brand. You can see a few samples on my website of brands I have created. I want to give you glimpse into what I turn over with a completed project. For my clients – I want them to use their brand to the fullest… This means that they use their logo along with their chosen colors, their fonts, patterns etc. Fonts: Similar to color, a font also helps set the tone. Whether you choose a serif font, a sans serif font or a script… make sure that you choose what bests represents your vision. 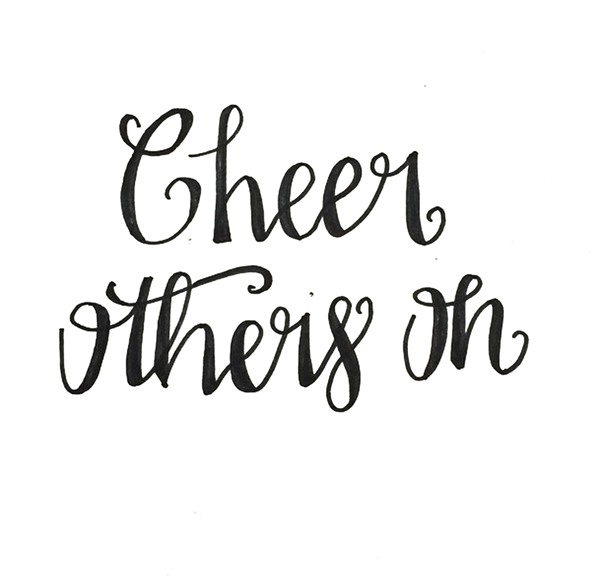 These days hand written fonts are very popular – These are great for lifestyle blogs, individual brands, hand made companies, but if you are a corporation or a business, it may be best to pick a font that is a little cleaner. Below are a few brand sheets that I have completed recently… notice the differences in colors, styles and how you can immediately tell the differences about these brands. If you have questions about your current brand or about a brand you wish to create… let’s talk! I recently opened an etsy shop you guys!!! It is a slow process, but I am loving the way it constantly pushes me to be creative in a different way! There is so much to know and learn about selling online. I had no clue what I was doing, so I called a friend of mine, Karen, that has had a shop for a while now… Flower Floozy Designs. I was thrilled that she was willing to sit down and share some of her best practices! She sells online, but also goes to various craft shows throughout the year! Her business is booming and I am so happy for her! While we were talking, she asked me about doing a logo for her. You know I love a good logo design job, so I jumped at the opportunity! Here is what we came up with! She does a lot of tile work that is just amazing, and with her name, I was really happy with the design we came up with! Don’t you just love the bright, cheery colors we chose! She has committed to using all recycled items, which I love! Old dishes, pottery, and goodwill finds to change these items! And… her next challenge is stained glass… I’m telling you, she can do it all! Below are a few items from her shop that are available now! Those birds are adorable! I love the idea of having them on a shelf or as an ornament! 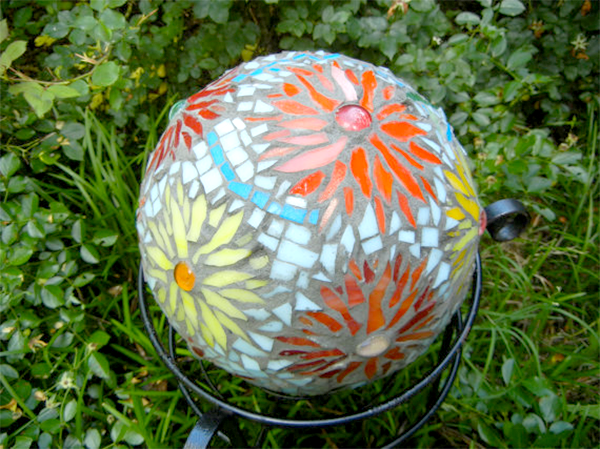 These garden gazing balls are selling like hotcakes! – old bowling balls and old dishes. 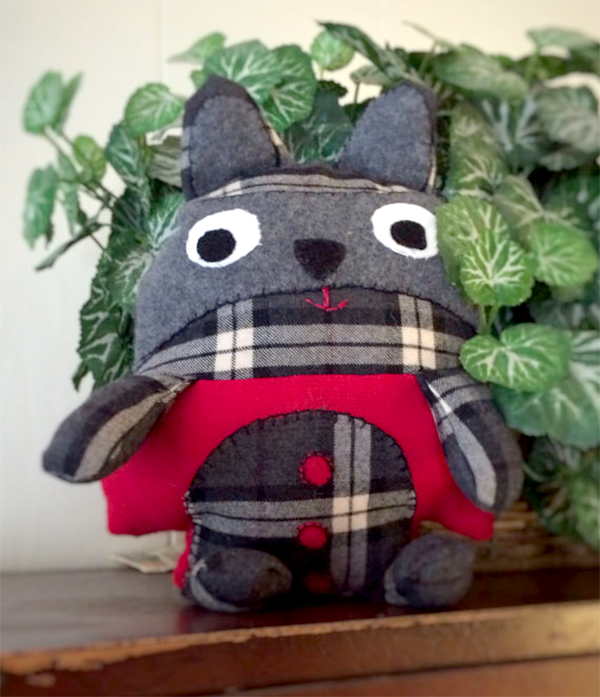 Then we have this little guy – such a cute raccoon. I could just see him in a little boys nursery! Be sure to follow her on all of her social media outlets! 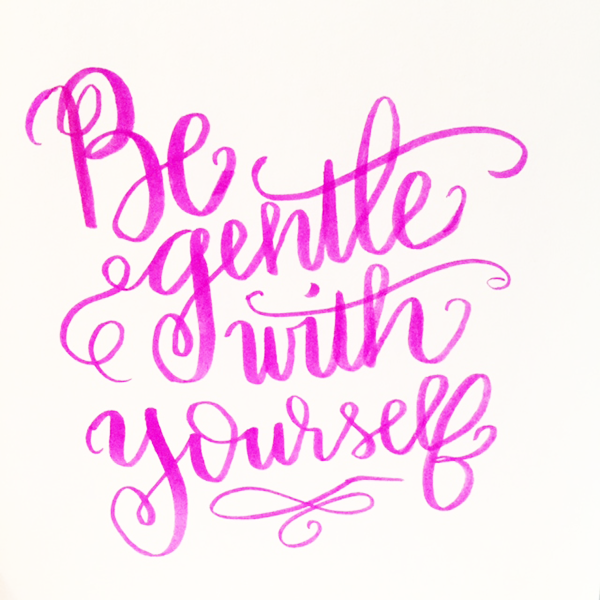 I will say that participating in the hand lettering challenge by @Jennymaiedae has proven to be very helpful to me and my practice! I have really enjoyed experimenting with different pens and papers. A recap of my first half of the month can be seen here. Now for a few favorites for the end of the month. I hope you like viewing these as much as I like doing them! 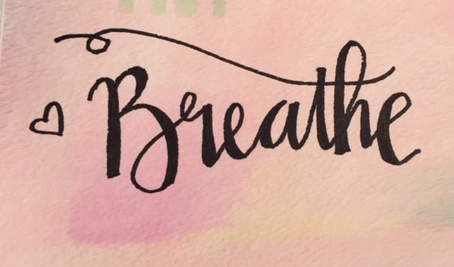 I have practiced calligraphy and hand lettering for years, but recently I have put more focus to my practice. When @Jennymaiedae posted her line up for #letteritjune on Instagram, I knew this was something that I wanted to participate in. 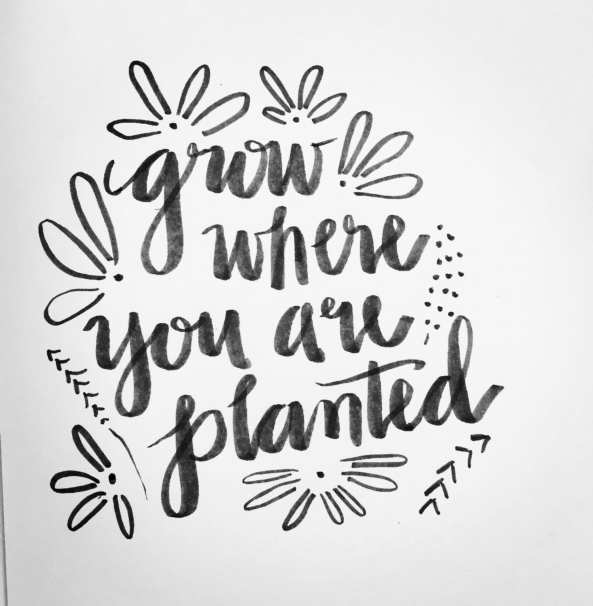 I am about halfway through the month and have really enjoyed how I have pushed myself and tried new styles, techniques and pens. 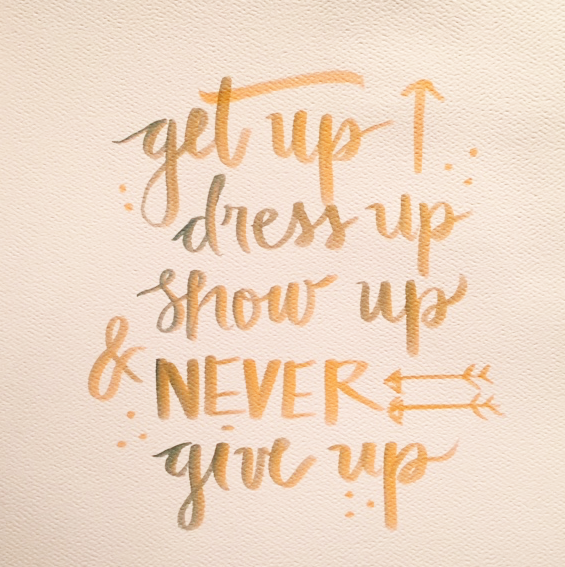 I have also used a bit of my faux calligraphy, which you can see more on this here. Below are a few from the first 15 days of this month! 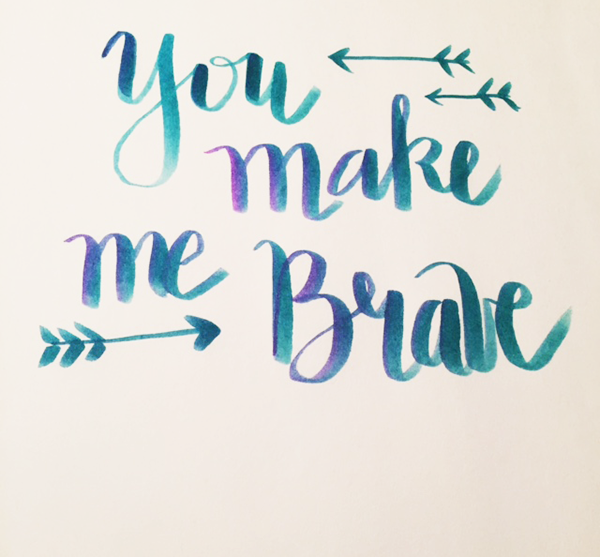 If you do hand lettering I challenge you to join in! This has really helped me. Follow along on Instagram or Facebook to see all of my sketches and drawings. I have been spending a little bit of time away from writing again… I have a special someone taking up my time these days! 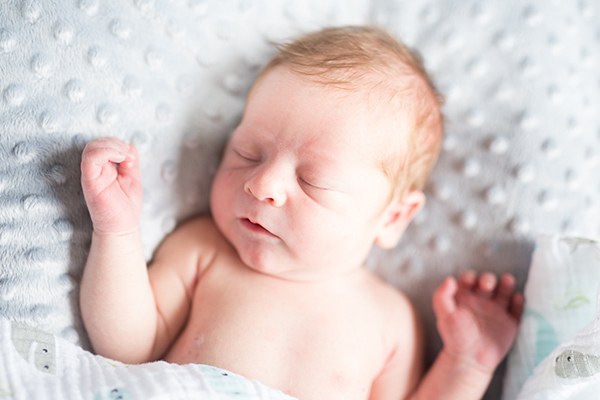 On April 7 we welcomed the most precious little guy! He has give us a joy we didn’t know could exist. I had a friend of mine take newborn photos of him and his special space. So before I go on… thank you to Tiffany Evans. We love the way everything turned out! I am a lover of all things artistic, home made, DIY, and creative. 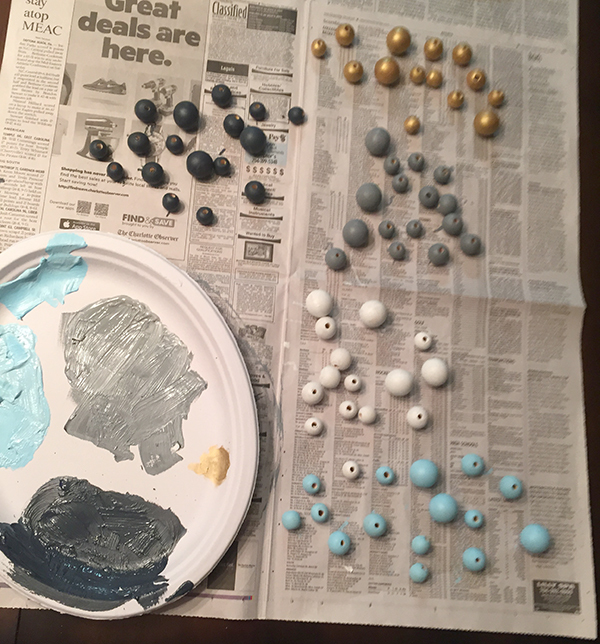 I knew I wanted to make / paint / draw a lot of the things to fill his nursery. What I didn’t expect was all of the other beautiful things people made for me! I love every ounce of what is in his special room! I the picture above you can see all of the items that are included in his gallery wall. 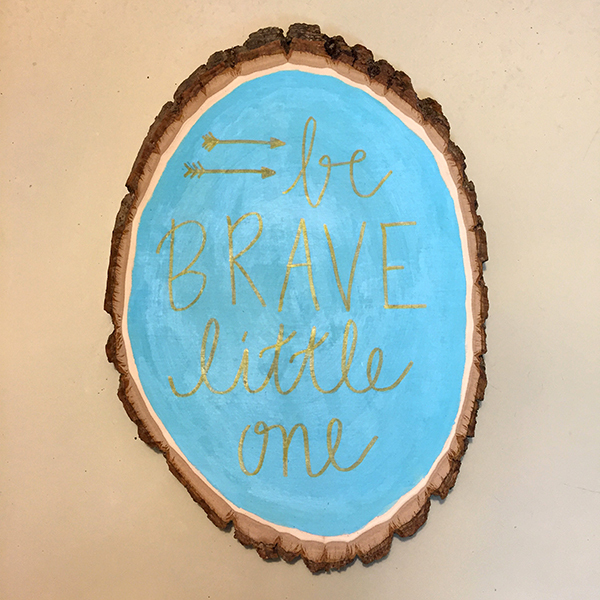 Far left is a wooden plaque I purchased at Hobby Lobby, painted and hand lettered a quote “be brave, little one” I loved the way it fit his adventure nursery! Here is a closer look. 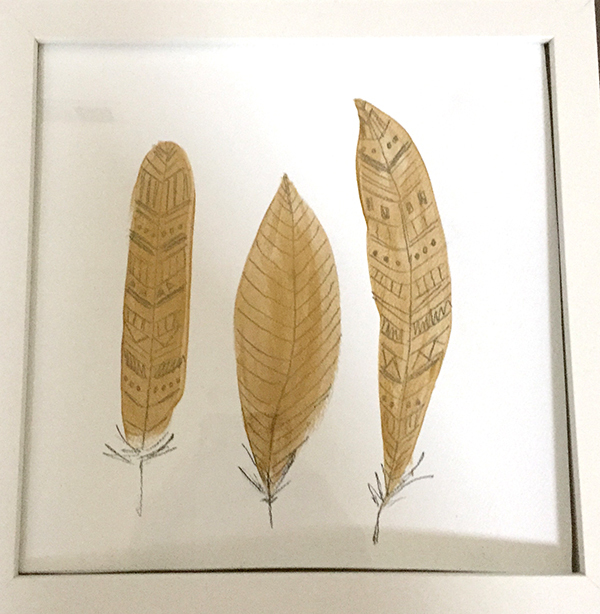 In the center was a gift from a sweet friend of mine, the arrow was a hand made/painted gift from another sweet friend, and then below that is a painting I did of some gold feathers. These were a simple painting and then I hand drew some lines in pencil. I am really happy with how that turned out. 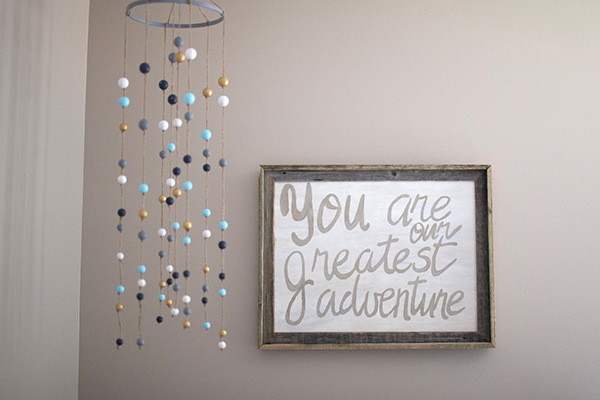 Here is the mobile that I made and a picture for above his crib. The mobile was made out of painted wooden balls in various sizes, some twine and a cross stitch circle. I didn’t really have a plan, but started with my vision and I am so happy with the final product! The sign was my very first attempt at painting on canvas. I have gotten better, but loved something about the imperfections this one has. I see it and am reminded of where I came from. 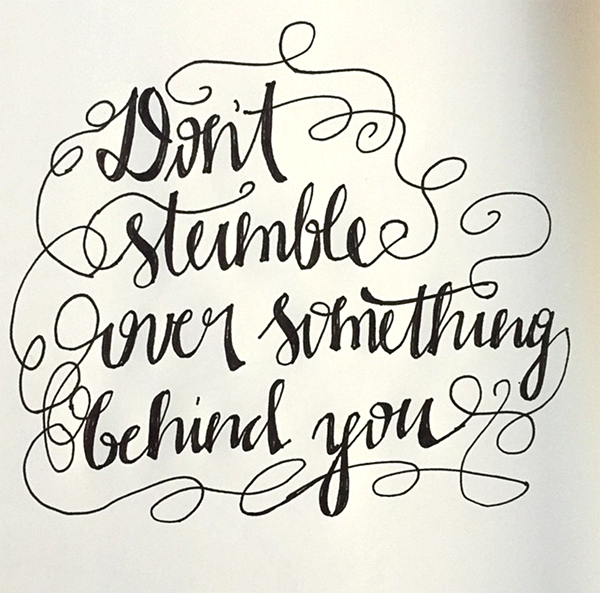 I love a quote I often tell myself from a blog I follow – It doesn’t have to be perfect to be beautiful – The Nester. If it was made with love, it is perfect to me! Here is a picture of the mobile mid process! I can’t wait to read a book to our sweet boy every night! I love everything about the idea of story time and him asking questions about the pictures! 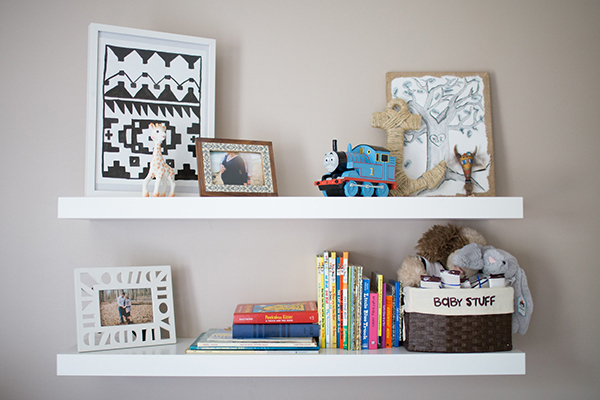 These shelves have some artwork I painted, some photos from our maternity photoshoot with Emily Chidester (more on those here), an anchor that a friend made for a shower I was given as well as a tree design another friend of mine drew with leaf thumb prints of shower attendees. In addition, a bank from grandma and some stuffed animals from friends! All of my books are gifts or goodwill finds. And finally here is an old dresser that my husband used as a child. 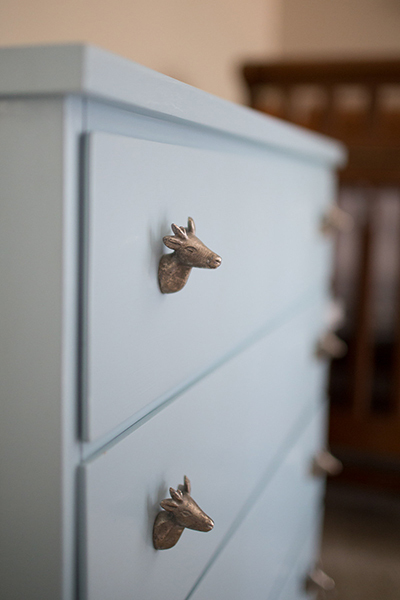 For christmas his parents had it painted blue to match the new room and then I found these adorable drawer pulls at Hobby Lobby. They are one of my favorite things about this space! 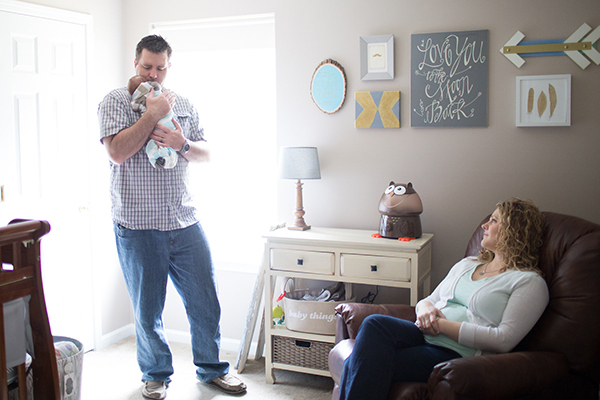 I can’t wait to see our guy grow up in this room and let him know that his Mommy and her friends made each little detail so special for him!